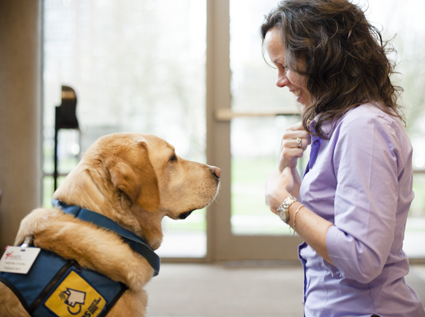 Newton is a Pacific Assistance Dogs Society dog who works with recreation therapist Melissa Clave Brulé. An integral part of the Dr. Peter Centre team, Newton provides unconditional love for our participants and residents. Newton's happy face, wagging tail and warm nature attract everyone who visits the Centre and makes participants and residents feel special. Many participants and residents seek him out throughout the day to sit and cuddle, talk to him and even shed a tear as he provides them with his strong, silent support. Newton is the Centre's prized treasure, with both staff and clients referring to him as "our dog".